a maneuver, method, or procedure. For names of specific techniques, see under the name. The manner of performance or the details of any surgical operation, experiment, or mechanical act. See also: method, operation, procedure. /tech·nique/ (tek-nēk´) a maneuver, method, or procedure. dot blot technique a technique for protein detection, analysis, and identification that is similar to the Western blot technique but in which the samples are merely spotted directly onto the membrane through circular templates. fluorescent antibody technique an immunofluorescence technique in which antigen in tissue sections is located by homologous antibody labeled with fluorochrome or by treating the antigen with unlabeled antibody followed by a second layer of labeled antiglobulin which is reactive with the unlabeled antibody. isolation-perfusion technique a technique for administering high doses of a chemotherapy agent to a region while protecting the patient from toxicity; the region is isolated and perfused with the drug by means of a pump-oxygenator. Jerne plaque technique a hemolytic technique for detecting antibody-producing cells: a suspension of presensitized lymphocytes is mixed in an agar gel with erythrocytes; after a period of incubation, complement is added and a clear area of lysis of red cells can be seen around each of the antibody-producing cells. Mohs' technique microscopically controlled excision of skin cancers in which the tissue to be excised is first fixed in situ with zinc chloride paste (Mohs' chemosurgery), or in which only serial excisions of fresh tissue are used for microscopic analysis (Mohs' surgery) . Northern blot technique a technique analagous to a Southern blot technique but performed on fragments of RNA. Pomeroy technique sterilization by ligation of a loop of fallopian tube and resection of the tied loop. (A), Tube is grasped with forceps; (B), a loop is ligated; (C), the loop is excised; (D), several months later, the fibrosed ends of the tube separate. Southern blot technique a technique for transferring DNA fragments separated by electrophoresis onto a filter, on which specific fragments can then be detected by their hybridization to defined probes. Southwestern blot technique a technique analagous to a Southern blot technique but in which proteins are separated by electrophoresis, transferred to a filter, and probed with DNA fragments to identify expression of specific DNA binding proteins. Western blot technique a technique for analyzing proteins by separating them by electrophoresis, transferring them in place to a filter or membrane, and probing with specific antibodies. the method and details followed in performing a procedure, such as those used in conducting a laboratory test, a physical examination, a psychiatric interview, a surgical operation, or any process requiring certain skills or an ordered sequence of actions. Also spelled technic. The manner of performance, or the details, of any surgical operation, experiment, or mechanical act. n any systematic procedure for achieving a desired result. n a therapeutic approach associated with chiropractic medicine in which measured thrusts are delivered to the spine by using a spring-loaded device that resembles a hammer. n.pr a method (named after Frederick Matthias Alexander) to become aware of pos-ture, breathing, coordination, and balance during normal, everyday activities so that unnecessary muscular tension can be released and new methods of moving can be learned. n a method of osteopathic manipulation in which a restrictive barrier is reduced through gentle, repeated motion of the target body part through the restricted portion of its range of motion. n sterilization practices that decrease the likelihood of microbial infections between medical practitioners and patients. n chiropractic manipulation that em-ploys rapid accelerated force, applied either mechanically or manually. n.pr an energetic chiropractic method. n original system developed by Tom Bowen (1916–1982) of powerful yet subtle and painless soft tissue mobilizations. n.pr a method of exercises designed to retrain patients' breathing to in-crease tolerance for higher levels of carbon dioxide (CO2). n neuromuscular technique in which the practitioner applies mild pressure to a tissue. See also flat compression and pincer compression. n See proprioceptive neural facilitation. n an osteopathic approach in which the afflicted joint is placed in a relaxed position to stop the erroneous proprioception underlying a somatic dysfunction. See also proprioception and somatic dysfunction. n most com-mon chiropractic approach; the entire spine is adjusted by using a wide variety of spinal manipulation approaches. n an indirect osteopathic technique in which the affected physical component is moved from the restrictive barrier, after which a high velocity/low amplitude technique is applied in the same direction. n indirect manipulative technique that employs practitioner-induced movement while the area of complaint is continuously palpated. The practitioner takes the joint in all possible directions of ease (purposely avoiding directions that bind) to gradually guide it to the point of greatest ease. The practitioner's palpating hand allows him to feel the point at which the affected area is no longer in pain. n.pr chiropractic approach developed by Clarence S. Gonstead aimed at correcting spinal dysfunction resulting from displaced intervertebral discs. Specific spinal adjustments are done using static and manual palpation, instrumentation and x-ray analysis. n a type of hypnosis often used during childbirth to help patients remain in control during labor and delivery. Patients are encouraged to concentrate on—rather than try to ignore—their contractions, which act as a stimulus to relax the body and mind. n chiropractic soft tissue technique by which the practitioner pushes around the paraspinal point of concern from different directions until a reduction in pain is noted; the pressure is applied for at least twenty seconds. n application of constant pressure to soft tissues to relax and to reduce the activity of reflexes. n sequential method used to disable a trigger point and the surrounding tissues. It involves the use of muscle energy techni-ques (MET), strain and counter-strain (SCS), and direct inhibition techniques to specifically target soft tissues that are dysfunctional. See also MET, SCS, and trigger points. n in osteopathy, a system of techniques used for myofascial release. n.pr chiropractic technique developed by HB Logan, that comprises light, sustained pressure exerted against a specific point at the base of the spine. Also uses the surrounding muscular structure around the sacrum as a lever to balance the entire spinal structure. n touch technique used in conjunction with aromatherapy applications. See also aromatherapy. in utero by relieving energy flow blockages. n method of stretching muscles by using resistance to improve the range of motion. n.pl methods that employ prolonged pressure to stretch muscle tissue beyond its usual length to achieve better movement by reducing fascial restrictions. n a combination of indirect and direct massage that reduces fascial tension and muscle spasm. n a chiropractic approach used to release negative emotions (conscious or unconscious) that manifest as spinal subluxations. n chiropractic approach that corrects misalignments in the spine and skull to improve neurologic functions. n procedure that involves the stimulation of neurological reflex points (neurolymphatic reflexes) located all through the body, particularly between the ribs, along the spine, and in the pelvic region; thought to influence lymphatic drainage. Activation of these reflexes results in strengthening of muscles. 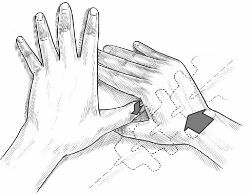 n method in which the practitioner uses his or her fingers to feel tissue abnormalities and gently manipulates the areas to restore normal function. n method employed to improve blood flow and muscle strength via the neurovascular circuits found in the skin by activating them with small tissue tugs. n energy-based therapy in which the patient recalls a traumatic event while moving his or her eye in various patterns; used to treat psychological problems. n an osteopathic manipulative procedure for treating somatic dysfunction by using specific applications of vibratory force. See also somatic dysfunction. n manipulative treatment that includes application of mild pressure to two sensitive points that are related to one another. n an osteopathic technique using movement (passive or active) of a body part to its full range of motion in any or all planes. n a system of soft tissue manipulation that involves stretching the osseous structures and applying pressure for five to seven seconds to trigger points. n chiropractic method in which blocks of various shapes are applied to the body over a period of time to align the spine. n method of chiropractic care in which manipulative reflex techniques are used to correct spinal, cranial, and organ-related problems. n.pr a series of osteopathic manipulative procedures used to prevent or alleviate restrictions in the soft tissues around the shoulders. n an osteopathic technique for immunostimulation in which rhythmic compressions are applied to the area over the patient's spleen. n an osteopathic technique for increasing free motion through repetitive applications of low-velocity/medium-amplitude force to the restrictive barrier undergoing treatment. n.pr a system of osteopathic techniques for diagnosing and treating somatic dysfunctions; consists of nonrepetitive applications of direct and indirect pressure to the joints. This technique is attributed to the founder of osteopathy, Andrew Still. See also somatic dysfunction. n.pr chiropractic technique developed by Dr. Clay Thompson; addresses all areas of the spine to reveal any vertebral subluxation. See also subluxation, vertebral. n a short lever osteopathic technique that uses shearing forces in combination with compression. 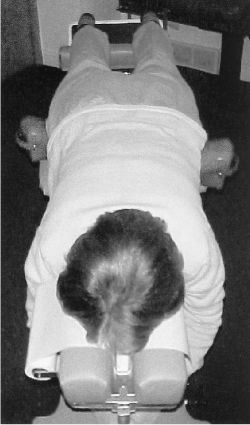 n a variation of myofasical release technique in which the practitioner uses fingers or a device to apply pressure along specific pathways of connective tissue. The purpose of this approach is to change pathologic cross-linkages in fascia. n.pl manipulative techniques for finding areas of the body in which the range of motion is limited and for releasing the blockage responsible for the limit by positioning into the blockage. Examples of such techniques include high-velocity/low-amplitude, positometric relaxation, and direct myofascial release. n a set of neuromuscular techniques in which the practitioner applies friction to myofascial tissues in a transverse direction or in the direction of the fibers. The type of technique applied depends on the condition of the affected tissues and desired results. n.pl manipulative techniques for finding areas of the body in which the range of motion is limited and for releasing the blockage responsible for the limit by positioning away from the blockage. Indirect techniques use the intrinsic forces of muscles, ligaments, and tendons to facilitate release. n.pl analysis and advice that physicians offer to their patients to make health-promoting changes in their lives. May include stress-reducing strategies, exercise, and dietary modifications. n.pl scientific term used for qi gong. See also qi gong. n.pl a group of mental techniques based on the recognition that what one chooses to focus upon defines who one is and how one experiences the world. n.pl stretching and balancing methods developed to correct imbalances present in the viscera. Manner of performance or details of any surgical operation, experiment, or mechanical act. n 1. a skillful and detailed method of executing procedures to accomplish a desired result. technique pertains more to the artistic skill involved. n task performed in a sterile environment in order to avoid contact with harmful bacteria. n an intraoral radiographic technique whereby an angle formed by the mean plane of the tooth and the mean plane of the film is bisected, and the central ray is directed through the tooth perpendicular to the bisection. This is the application of Cieszynski's rule of isometry. See also rule of isometry, Cieszynski's. n an intraoral radiographic technique using a specified degree in vertical angulation from the horizontal plane. It is a variation of the bisection of the angle technique and assumed to be the correct angulation for the majority of patients. n a method of investing wax patterns, whereby the pattern is covered with a primary layer of investment; this core is then invested, before or after the primary investment has set, in an outer, thinner mix of the same or a different type of investing material. n a technique by which the anatomic form of the teeth and immediately adjacent structures is recorded and by which the free-end denture foundation areas are registered in their functional form. n.pr in dental amalgam, a procedure using mercury and alloy in approximately a 1:1 ratio, thus not having residual mercury in the plastic mix. n the method used to obliterate the space in the root of the tooth once occupied by the dental pulp. n the injection of a local anesthetic that anesthetizes the mandible, along with the floor of the oral cavity, the anterior two-thirds of the tongue, the skin covering the zygomatic bone, and corresponding facial, buccal, and lingual tissues. n a method and manner used in making a negative likeness. The series of operations or procedures used for making an impression. n the use of an extended cone distance, generally 14 inches (35 cm) or more, in oral radiography. It is generally used with, but not confined to, parallel film placement. n refers to a topical anesthetic dispersal technique that controls the amount and rate at which a drug is administered. buccal. See also localization, radiographic; technique, parallel. n a technique in intraoral radiography in which the film is positioned parallel to the long axes of the teeth and the central ray is directed perpendicular to both the film and the teeth. n any of several methods for placing radiographic film to capture images of tooth root structure. n a surgical incision of a circular area of soft tissue immediately above a submerged implant in order to expose the full diameter of the implant platform. n office jargon for a one-handed method of needle recap and disposal in which the needle is used in an upward sweep to lift a safety cap onto the needle. The needle is then removed and discarded into a sharps container. n the use of a short cone distance, usually 8 inches (20 cm) or less, that is supplied by the manufacturer as short cone. It is generally used with, but not confined to, the bisection of the angle technique. n the friendly but businesslike conveying of ideas over the telephone. n a casting procedure whereby compensation is made for metal shrinkage by thermal expansion of the refractory investment mold. n a casting procedure whereby compensation is made for metal shrinkage by thermal expansion of the wax pattern before setting of the investment. the method of procedure and details of a mechanical or chemical process or surgical operation. set of rules for an x-ray machine with the objective of obtaining the same quality of performance at each operation. Includes the coordination of the variables, kilovolt peak (kVp), milliamperage and time (milliamp-seconds, mA⋅s), and tube-to-table distance, screen-film combination and processing. Q. Any other methods of pain relief besides the medication I am taking? I need help ……I've Fibromyalgia for 15 years, it’s been a very long journey and it makes me feel helpless. I stop taking on medicines many times and once the pain increases I again take them. I know my life is only with medicine and I have to live this way for my children. How it will be if I start taking on, any other methods of pain relief besides the medication I am taking…please tell me. A. Try yoga, hot/warm baths, resting when needed, exercise as you can tolerate without making pain worse, meditation,walking a little everyday, having a positive attitude and reaching out for support, talking and realizing you are not alone can help a great deal. I had to accept I could not make it through my day without medication! When you go off and on meds, this can sometime result in having to start all over again to reach "theraputic" levels. You are not a druggie...staying on your meds enables you to be as productive as possible in your life and with your family.Good Luck and God Bless! Q. what is the relation between breast Cancer to other kinds of cancers? what are the treatment methods? A. Breast cancer, as other cancers all have many causes, from genetic predisposition to environmental factors such as bad nutrition and obesity. Some cancers are known to be caused by smoking, whereas others don't have a direct connection. Breast cancer diagnosed early can be treated with surgery (removal of the lump) and radiation treatment, with or without chemotherapy or hormonal treatment. It varies with different clinical stages. A. Breast cancer is estrogen-dependent, i.e. increased exposure to un-opposed estrogen increase it's risk, so it's also related, at least epidemiologically to ovarian cancer and uterine cancer. Mutations that increase breast cancer's risk, such as BRCA2 also increase the risk of other cancers such as pancreas cancer, skin cancer etc.